Organic, freeform ring with tanzanite. 14k white gold. Handcrafted granulation cuff bracelet. Wide sterling silver cuff with spherical granulation, branch like textures and patina. Lotus engagement ring with bezel and pave set diamonds. 18k yellow gold. Art Nouveau style ring. Bezel set opal in 14k yellow gold. Custom made, freeform, sterling silver clasp and hinge were created for this antique ivory bangle. The clasp includes, two pear shaped citrine stones, bezel set. Musical, fluid freeform brooch. Fabricated in sterling silver with patina. "contemporary art nouveau"
Gents freeform band. Ruby set in 14k white bezel on very fluid freeform band handcrafted in 14k yellow gold. Custom made free-form ring with Lapis Lazuli. Bezel set Lapis in 14k yellow gold. "contemporary art nouveau"
Free-form ring inspired by the Calla Lily. Green garnet set in 4-prog setting. Custom handcrafted in 14k white gold with patina. Handcrafted, free-form, triangular brooch with spherical granulation. Fluid, organic, free-form brooch. Inspired by underwater vegetation. Sterling silver with patina. Bangle with spherical granulation and branch like textures. Sterling Silver with patina. 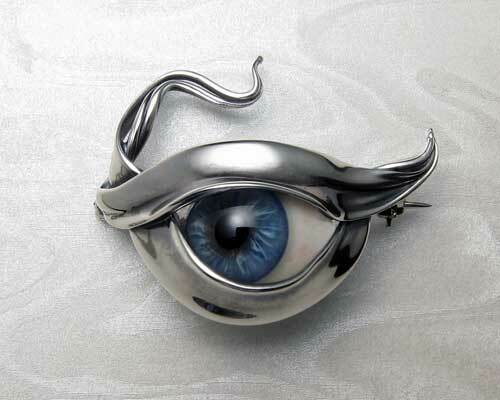 Contemporary art-nouveau brooch. Dangling baroque pearl., with amethyst and peridot stones bead set. Custom handcrafted in 14k white gold with rhodium finish. Unique, fluid, organic, free-form engagement ring set. Diamond in 4-prong setting, pave diamonds bead set. 14k yellow gold. Musical, Art Nouveau, free-form ruby brooch. Musical, Art Nouveau, ruby brooch. 14k yellow gold with rubies beed set. Asymmetrical, fluid, free-form necklace with blue moonstones. Asymmetrical, fluid, free-form necklace. Blue moonstones bezel set. Sterling silver with patina. "One-of-a-kind." Very unusual, organic free-form ring. Organic free-form ring. Handcrafted in 14k white gold, with ruby set in split bezel setting. Have your wedding bands feature your significant other's fingerprint. Organic, musical, freeform engagement ring with blue moonstone. Freeform earrings with hanging baroque pearls. Amethysts and peridots bead set, Custom handcrafted in 14k white gold with rhodium finish. Freeform ring with baroque pearl bezel set. Amethyst and peridot bead set, Custom handcrafted in 14k white gold with rhodium finish. Handcrafted wedding rings with spherical granulation and branch like textures. 18k yellow gold with 14k white gold borders. The stone of the engagement ring is slipped through the loop in the band and then together they are placed on the finger. Diamonds set in custom handcrafted 14k white gold with rhodium finish. Wedding ring with continuous wrap and spherical granulation. Custom handcrafted in sterling silver with patina. Free-form earrings with blue moonstones. Musical, organic earrings, blue moonstones bezel set. Sterling silver with granulation and patina. Wedding ring with bezel set, black star sapphire. Custom handcrafted in 14k white gold with rhodium finish. Interwoven multiple strand free-form band. Free-form drop pendant. One-of-a-kind, fluid design, cast in 14k yellow gold. Diamonds bezel and bead set. Asymmetrical engagement ring. Orange sapphire set in 4-prong setting with smaller accent stones pave set. 14k white gold with rhodium finish. Freeform, Art Nouveau style engagement ring set. Art Nouveau style engagement ring set. Handcrafted in 14k white gold with rhodium finish. Diamond set in 4-prong setting. Wraparound free-form band. Carnelian stone bezel set in 14k white gold with rhodium finish. 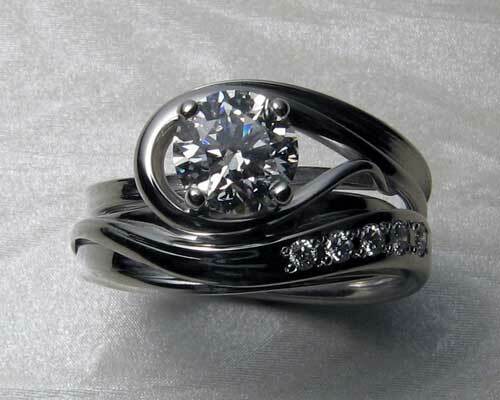 Asymmetrical engagement ring with spiral-like flow. 1.6ct. brilliant cut diamond set in 4-prong setting. 14k white gold with rhodium finish. Free form, asymmetrical engagement ring. Asymmetrical engagement ring, 14k white gold with diamond set in 4 claw setting, rhodium finish. Free-form engagement band with spherical granulation and branch like textures. Three diamonds set in white gold bezels, set on 18k yellow gold band with white gold borders. "one-of-a-kind"
Very fluid wave-like ring. Diamond and tsavorite (green garnets) set in handcrafted, 14k white gold with rhodium finish. Contemporary, Art Nouveau style engagement ring with blue moonstone. The bezel set blue moonstone, gives the very delicate appearance of a drop of dew nestled in the fluid, organic, whiplash lines reminiscent of the Art Nouveau period. In the recessed areas are pave set diamonds that have a sparkling, shimmering affect against the white gold. materials: bezel set blue moonstone, pave set diamonds, 14k white gold with rhodium finish. Diamond bezel set on band style engagement ring. Ladies and gents bands, both 14k white gold with textures and patina. Asymmetrical engagement ring. Diamond set in 4-prong setting, emeralds pave set. 14k white gold with rhodium finish. 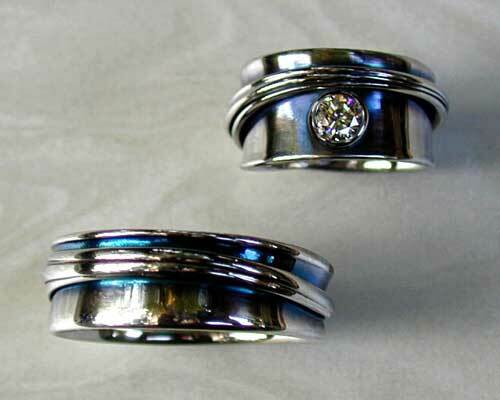 10mm wide, free-form wedding band with diamond bezel set. 14k white gold with rhodium finish.